OOTLE15, or the 2015 Open Old Testament Learning Event, is a 13-week introductory course to the Hebrew Bible. The course instructor is G. Brooke Lester, Assistant Professor of Hebrew Scriptures, and Director of Digital Learning, at Garrett-Evangelical Theological Seminary. To join the course, you will need to have a blog and twitter account, and sign up here. The course begins on February 3, 2015, but you can start at any time. Professor Jacob Wright of Emory University is to present a 7-week Coursera MOOC (Massive Open Online Course) on the development of the Hebrew Bible/Old Testament: “The Bible’s Prehistory, Purpose, and Political Future”. The course will commence Monday, May 26, 2014, and enrolments are now open. —and that the Bible itself has a major role to play in our futures. This video introduces the Hebrew Bible and discusses the languages in which its various texts were originally composed. This video clip briefly explains the authorship of the Hebrew Bible. This video clip offers an introduction to the question of whether or not the Hebrew Bible presents the inspired Word of God and, if so, to what extent it does. 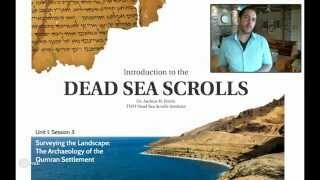 This video clip offers an introduction to the geography relevant to the study of the Hebrew Bible, focusing on the Ancient Near East (A.N.E.). This video clip offers an introduction to the Documentary Hypothesis, or the leading scholarly hypothesis of the Hebrew Bible’s authorship. This video clip continues my series on King David, describing how he ascended to the throne over all of Israel. This video clip continues my series on King David, describing his relationship with the prophet Nathan. This video clip concludes my series on King David, describing David’s relationship with Saul’s daughter Michal. This video clip introduces the patriarchs and matriarchs of Genesis 12-50, or Abraham, Isaac, and Jacob and their respective wives and mistresses. This video clip describes Israelite eponymous ancestry. This video clip offers a guide to appropriately dating and understanding geography while studying Israelite eponymous ancestry. This video clip introduces the 3 cycles of tales of Genesis 12-50 and explains the Abrahamic covenant. This video clip introduces the structure of the Book of Exodus and Yahweh’s self-identification in its pages. This video clip introduces the Mosaic Covenant. This video clip introduces the Exodus Event. This video clip continues my introduction to the Exodus Event. This video clip describes the centrality of animal sacrifice to religious worship in the Ancient Near East and, in particular, to the Hebrew people’s worship of Yahweh. This video clip introduces the ancient Hebrew concept of ritual cleanliness. This is my comedic, educational video covering the story of Ehud and Eglon from the 3rd chapter of Judges. This video clip introduces the Syro-Ephraimite War, providing historical context for the conflict. This video clip continues my introduction to the Syro-Ephraimite War. This video clip concludes my introduction to the Syro-Ephraimite War. This video clip defines Ancient Israelite prophecy. This video clip describes the 3 stages of the nebi’im, or prophets: the bene nebi’im, the former prophets, and the latter/written prophets. This video clip describes the relationship between ancient Israelite prophecy and the royal court. This video clip provides an introduction to the Book of Job, focusing on the Book’s first scene. This video clip discusses the dialogues of the Book of Job (the text’s center) and the Book’s conclusion. This video clip introduces our discussion of the images of God in the Book of Job and discusses the Book’s images of God as the Majestic Thunderer and as the Enforcer. This video clip discusses the images of God in the Book of Job as the Bully and as the Buffoon. Images of God in Job – pt. 5 – How should we view God? This video clip concludes my lecture on the images of God in the Book of Job, discussing the hidden image of God in the Book of Job as a just God and exploring the implications of the lecture’s body. This video clip presents the definitions necessary to discuss the topic of Wisdom in the Old Testament and introduces the Wisdom Literature. This video clip describes instances in which wisdom is seen in parts of the Bible outside of the Wisdom literature. This video clip discusses the Book of Proverbs. Open Yale Courses offers an introductory course to the New Testament, called “Introduction to the Old Testament (Hebrew Bible)“. The course includes 24 lectures, available to view in video, audio, and transcript formats.